A couple months ago, I decided that going on retreat was going to be a "treat yo self" kind of venture. 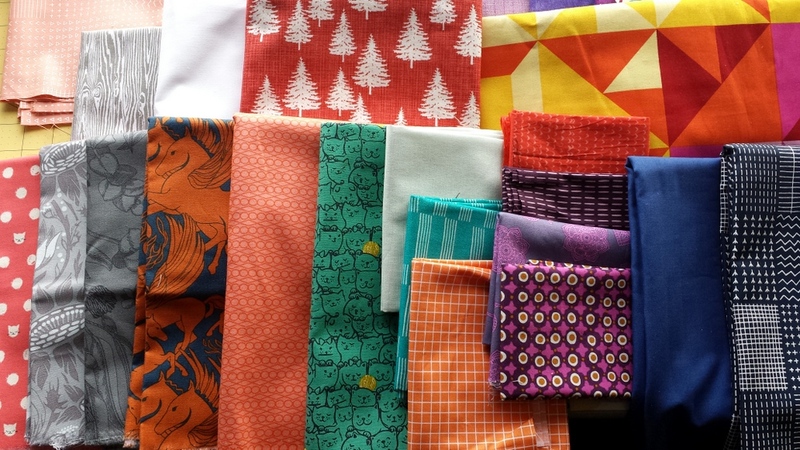 I really DID need some fabric for some exciting projects coming up, and, well, you can't go wrong with the stash fillers. Tom and Donna (from Parks and Recreation) totally get it. Let's take a closer look... because if you're reading this, you're probably just as keen on pretty fabric as I am. All those left of center were chosen as basics from Burkholder Fabrics as stash fillers. Some are colors I don't have much of (peach, limey green), and some are Carolyn Friedlander rebuys that I've run out of (and can't bear not to make with in the future). Some purples because... well, I never ever deny a good purple. You'll notice I mostly buy tone on tone, 1, or 2 colored fabric - that works best in my fabric stash. However, that Cotton and Steel building fabric in the middle jumped into my cart before I could protest. All the large purple cuts on the bottom are gifts from my secret sewist @shannonatsilverforge! I couldn't believe when they were sitting on my table! The top three are again some stash fillers, from The Old Country Store. I caved and bought a yard of that purple Tula Pink bird fabric at Burkholders - it's a wideback, so it's actually quite a large cut. I'd like to fussy cut at least one bird for my purple scrap quilt and use the rest as a backing. Underneath are more stash fillers from Burkholders (another good red fabric, we can't ever have enough good modern reds). And THEN, my friends, check out that half square triangle many-colored loveliness - that's Colorworks Concepts, Phase Two, by Deborah Edwards for Northcott. See the whole thing right here - AHH! I think I bought two yards. That's definitely backing material. Finally, the bottom fabrics are for an exciting, secret project! Last picture - at the top are three purchases from 1 Choice 4 Quilting (not pictured - purple Aurifil thread, too). The bottom row left until the green Cotton and Steel cats (which are for a specific project already) were purchased from Del Ray Fabrics. Many of the folded fabrics are the new Indah Me + You batiks by Hoffman, purchased from Elizabeth @andpins during the Attendee Marketplace. The purple Tula Pink was a gift from Liz @beadqueene, and the purple circular fabric was a swag bag acquisition from Cloud 9 Fabrics. 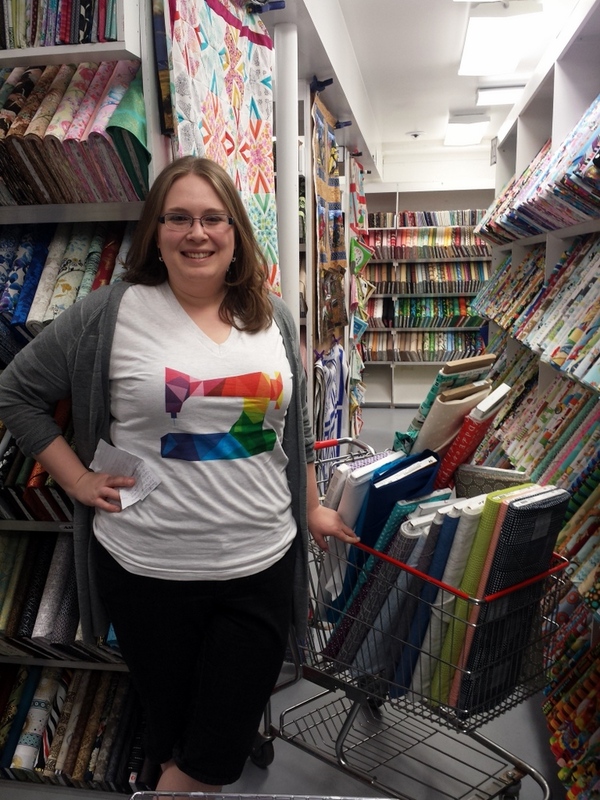 You know, just at the fabric store with a shopping list. In a sewing machine shirt (thanks, Patchwork Threads!). No big deal. Phew! Oh, and two more things. I treated myself to new Machinger's gloves for machine quilting, because mine were four years old and quite dirty. I can't believe how much better the grip and fit are on my new ones. I also purchased new Clover glass head pins thanks to Shannon - they are the best pins I've ever used, and I already see a difference. I think I'm sold for life. Since quilting is my job sometimes, it makes sense to invest in quality supplies - at least, that's how I'm justifying it. ;) It's healthy to replenish your tools no matter what! A big thank you to all the shops who sponsored the retreat and provided discounts and free shipping! 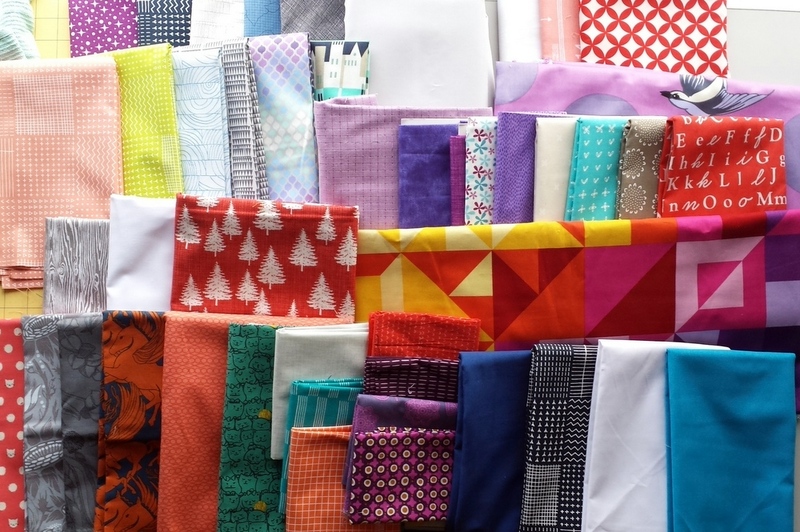 Have you made any fabric stash additions lately? Are you replacing any tools? All fabric stores should have shopping carts!!! But, then how would I show restraint? :P I think the purple Me + You fabrics (I saw them at retreat too) are the first purples I've truly loved... just need to find a place to purchase them, and work it in. :) Great, great additions! I have that white trees on red Christmas fabric, love it! Have it in mint green too. Need to find those C&S cats; they'd be perfect for my friend's quilt-in-percolation-mode. Love your t-shirt! I replaced my Olfa blades this week-AHHH! You do not ever realize how bad they are until you do! Wow!!! It looks like you fell into the deep end of the fabric store! What fun! Wow it looks like so much all spread out! And totally not your typical color scheme ;) You did show admirable restraint at Burkholder's this year (I guess it helps that the bolt sale wasn't out!) I can't wait to see how you use all these beauties this year. Wooo soooo many pretties! I would have come home with a lot of those too, especially shopping with friends and seeing their choices! I just put in a Hawthorne Threads order for some more of that light blue from Doe and a bunch of blue Lizzy whales (replacing the stuff I used in the Sunburst quilt)...and then I bought some Lizzy butterflies cuz what was I thinking not buying those before now?! And some more grey (shhh, I *know* I have too much grey and I *really* need to start making that grey and teal quilt. I knOW! )...and some scuba dudes because my brother has been posting tons of scuba diving photos from his days off in the Marshall Islands and UGH I wish I was at the beach. Also his birthday just past and I totally didn't get him anything, so I'm making him some zip pouches with the fabric. See what happens when you ask open ended questions on your blog and I am caffeinated?! I live about 15 minutes from Burkholder's- I wish I knew you were there!